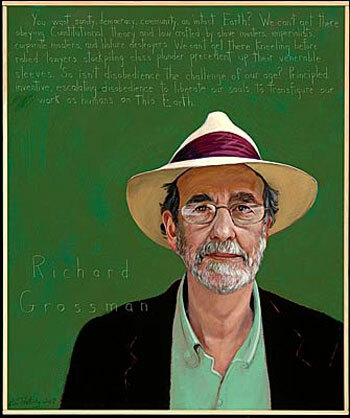 Richard Grossman, an extremely articulate, insightful historian, visionary, and teacher, who as my wife has observed, was gifted in the art of listening, died in New York City on 22 November 2011. His journey on earth had run across 68 years. As the 19th Century began, constitutions, laws and customs in the new United States denied the overwhelming majority of humans standing and equality before the law, along with authority to vote. As the 19th Century ended, legislative laws, judge-made laws, propaganda, armed might and persistent violence by the corporate class had transformed the United States from a minority-ruled Slave Nation into a minority-ruled Corporate Nation. This despite valiant mass resistance and magnificent people’s struggles. The emerging Corporate State – like the previous Slave State – was impressively constitutionalized. In a Corporate State, law, culture, contrived celebration and tradition illegitimately clothe directors and executive officers of chartered, incorporated businesses in governing authority. This is usurpation. A Corporate State nurtures, enables and expedites such illegitimate governing authority by violence enforced by courts, jails, police and military force, and by historians. Less-overtly ferocious institutions – forprofit and nonprofit – routinely reinforce that reality. In a Corporate State, law, culture and tradition enable corporate directors and executive officers to deny true self-governing authority to majorities of sovereign people, despite people assembling over and over and over again to petition governments in village squares and marbled halls. Like kings and tyrants before them, corporate directors and their operatives wield the law of the land, constitutions, elections, lawmaking, jurisprudence, education and “legal” violence to rule the many. They lord over all species, rivers, oceans, mountains, Earth materials, biological and natural systems. Elected and appointed officials in villages, towns, counties, cities and states and the United States administer this Corporate State on behalf of the nation’s minuscule corporate class. They do not have our consent. Neither do they represent the majority of life that is non-human – flying people, standing people, crawling people, flowing people, creeping people. They do not represent Earth’s biological or natural systems. By aiding, abetting and enabling corporate directors and executives, public officials are complicit in denial of Earth’s living realities. Like corporate directors and executive officers, these government officials have been acting beyond their legitimate authority. They are usurpers. Corporate directors and executives, in consort with public officials, have long been denying sovereign people access to justice; access to commensurate legal, electoral, and judicial remedies. They have long been denying people’s sovereign authority to govern our communities, states and nation. Generation after generation, this tiny minority has trained the rest of us not to see, not to think, not to act commensurate with Earth’s – and our – realities. This Act To Criminalize Chartered, Incorporated Business Entities is offered as a step toward changing how we see, think, organize. I met Richard Grossman in 1996 when he and Ward Morehouse gave a presentation on Revoking The Corporation in Palo Alto, California on January 26. The scope and depth of the frame each man expressed was breath-taking. I had not encountered such far-ranging understanding before of the history of the corporate form before, and especially, after the American Revolution. I spoke with Richard afterwards and collected printouts they were offering. Reading and learning more about what Richard and Ward had presented, I was inspired to begin building this section of rat haus reality on Ending Corporate Governance. Today's business corporation is an artificial creation, shielding owners and managers while preserving corporate privilege and existence. Artificial or not, corporations have won more rights under law than people have—rights which government has protected with armed force. Investment and production decisions that shape our communities and rule our lives are made in boardrooms, regulatory agencies, and courtrooms. Judges and legislators have made it possible for business to keep decisions about money, production, work and ownership beyond the reach of democracy. They have created a corporate system under law. This is not what many early Americans had in mind. People were determined to keep investment and production decisions local and democratic. They believed corporations were neither inevitable nor always appropriate. Our history is filled with successful worker-owned enterprises, cooperatives and neighborhood shops, efficient businesses owned by cities and towns. For a long time, even chartered corporations functioned well under sovereign citizen control. Undeterred by such common sense, judges redefined corporate profits as property. Corporations got courts to assume that huge, wealthy corporations competed on equal terms with neighborhood businesses or with individuals. The courts declared corporate contracts, and the rate of return on investment, were property that could not be meddled with by citizens or by their elected representatives. Within a few decades, judges redefined the common good to mean corporate use of humans and the earth for maximum production and profit. Workers, cities and towns, states and nature were left with fewer and fewer rights corporations were bound to respect. Wielding property rights through laws backed by government became an effective, reliable strategy to build and to sustain corporate mastery. Richard generously responded to queries I sent him with other writings and references. His knowledge and study of history was and remains extremely compelling. I am repeatedly struck by his masterful articulation of the root causes of things as well as his encyclopedic understanding of the trends and formations of historical processes, particularly how jurisprudence came to be redefined by legally trained humans serving corporate interests. In 2004 my wife and I attended a three day symposium of the Daniel Pennock Democracy School presented by Richard and Thomas Linzey Esq., the Founder and Executive Director of the Community Environmental Legal Defense Fund (CELDF). A great deal of U.S. history was explored and discussed. We looked across the centuries at the evolution and rise of the corporate form in America. Richard traced out some of the elements of how the rights of property were given a superior status over the rights of people beginning with slavery being written into the Constitution and sanctioned in law. The property class wrote their class bias into the Constitution in many ways. It's logical. That's what you do. Whenever property rights (up to this day, as expanded and expanded by the courts) then clash with human rights in our Constitutional framework it's no contest. We can trace down the history of labor rights, of worker rights, of slaves and indentured servants, and then even the history of the Thirteenth, Fourteenth, and Fifteenth Amendments coming up against property and the mechanisms of decision-making put into the Constitution so that to this day, the bias in the Constitution around property and whatever the courts define as property, when that clashes with the fundamental human rights as expressed in the Declaration of Independence and the United Nations international Declaration of Human Rights, whenever there's a conflict, our law and our institutions and our culture, in all of the tangible and intangible forces of the culture, say property rights prevail. . . .
Slavery was written in to the Constitution. The return of bonded workers, whether they were white servants or black slaves was written into the Constitution. It was legal. The force of law would enforce slavery. From the very beginning the tradition was that property rights trump human rights. . . .
[However,] early on, the corporation as a governing instrument of the ruling men of property was not that important because they had written the Constitution. They governed through the Constitution. Eighty percent of the people, of the human beings who were in the thirteen states, had no rights. Twenty percent were able to write a Constitution that denied the rights of eighty percent. So the rule of law, the coercive force of law was done through the state and they did not need the corporation as a major, powerful vehicle which they did after the Civil War. That's one point. The second point is think what was happening over the previous 300 years. There were feudal societies in western Europe and monarchy societies where the few governed the many. We don't have to know an awful lot about the history to know that the few ruled the many. And there was a lot of struggle, a lot of revolts in England, particularly in the 1600 and 1700s over the incredibly violent and vicious rule of the nobility. People were excluded from their own land. The common lands were being closed down. People couldn't make a living. There was the coming of factories and people having no choice but losing their independence as artisans and going into the factories. So there was an extraordinary culture where the majority of people were under the gun all the time in the most physical and violent, clear and apparent way. Everything didn't have to be intermediated through the New York Times and talk shows. People understood what was going on. And that was replicated in the thirteen states. The same ruling class people came over and their descendants ended up in Philadelphia writing the Constitution. Twenty percent of the people here were African-Americans, mostly slaves, brought by force. One-third to one-half of all the whites, except for the people who came with the Puritans, were indentured servants. A majority of the people basically were slaves whether white or black slaves, they were treated as slaves. They could not control their work. They could not quit. They could not travel. They had no rights. Plus women, plus native people, plus white men without property. There was a culture here where people could understand what was going on. The language reflected that. It hadn't been sundered by 200 years of propaganda and nonsense. As it was stated in The Alarm [above], people understood the various forces that were going against them. It's not because they were so advanced. It was because (in my opinion) it was the culture that reinforced that. That people still talked, working class people wrote pamphletts galore. Tom Paine's pamphlett was the largest selling pamphlett in the history of the world at that point, even though there were a lot more illiterate people than there are today. So people talked, people conversed about this situation. The majority got the shaft from the beginning. As we go along I would like to trace the thread of the corporation as it gained its rights. They didn't need the corporation to have all these rights because they had the law and most people didn't have rights. What we're going to trace is, increasingly, as they needed the corporation -- because more and more people started to struggle and gain their rights and forced their way into the law and begin to change the dynamics -- men of property decided (and we can trace this out after the Civil War) that they're going to make the corporation their principle governing instrument, along with the state. The corporation is going to be the means to control the state. The corporation then is going to become the source of all jobs, the source of all goodness, the source of all progress, and the institution that's replicated throughout our society. So when we form our environmental groups we set them up just like a corporation, the same model, the same laws, the same rules. They increasingly encompassed us in their structure, in their ways of thinking, in their set of relationships. As we as a country get further and further away from the revolutionary struggles, from that consciousness, from the great struggles of the Abolitionist Movement, the Anti-Segregation and Civil Rights Movement, the Labor Movement (when it was really a movement -- when the Labor Movement ceased to be a movement that was challenging the property class for setting the values to run this country, and became complicit as it did in the late 1940s), then there is no big institution and movement of people that is standing up and saying, We are putting forth a different way of looking at the world, of looking at ourselves, of looking at what kind of country this should be, at what values should be translated into law so that the law enforces our values. Instead of that we're always on the defensive. This Brief is intended to assist communities organizing to challenge the United States government's gift of constitutional powers to property organized as corporations. Accordingly, this Brief is NOT about corporate responsibility, corporate accountability, corporate ethics, corporate codes of conduct, good corporate “citizenship,” corporate crime, corporate reform, consumer protection, fixing regulatory agencies, or stakeholders. The Summary of Argument sets the frame through which we can view the terms of the contest we as a sovereign people are engaged in with subordinate public entities seeking to usurp evermore of our sovereign, inalienable rights. The people of these United States created local, state, and federal governments to protect, secure, and preserve the people's inalienable rights, including their rights to life, liberty, and the pursuit of happiness. It is axiomatic that the people of these United States -- the source of all governing authority in this nation -- created governments also to secure the people's inalienable right that the many should govern, not the few. That guarantee -- of a republican form of government -- provides the foundation for securing people's other inalienable rights and vindicates the actions of people and communities seeking to secure those rights. Corporations are created by State governments through the chartering process. As such, corporations are subordinate, public entities that cannot usurp the authority that the sovereign people have delegated to the three branches of government. Corporations thus lack the authority to deny people's inalienable rights, including their right to a republican form of government, and public officials lack the authority to empower corporations to deny those rights. Over the past 150 years, the Judiciary has "found" corporations within the people's documents that establish a frame of governance for this nation, including the United States Constitution. In doing so, Courts have illegitimately bestowed upon corporations immense constitutional powers of the Fourteenth, First, Fourth, and Fifth Amendments, and the expansive powers afforded by the Contracts and Commerce Clauses. Wielding those constitutional rights and freedoms, corporations regularly and illegitimately deny the people their inalienable rights, including their most fundamental right to a republican form of government. Such denials are beyond the authority of the corporation to exercise. Such denials are also beyond the authority of the Courts, or any other branches of government, to confer. Accordingly, the constitutional claims asserted by the [x corporation] against [y government] must be dismissed because those claims deny the people's rights to life and liberty, and their fundamental right to self-governance. There is no such thing as a silver bullet or a magic fix. This draft law is a step to move to reality. But it is also a step to open up different conversations beyond “greed and corruption.” . . .
Why should sovereign people aspiring to be self-governing bestow upon mere creations of law eternal existence? Why give them supreme authority – governing powers – over their creators? Why subsidize investors with the gift of limited liability and other privileges galore? If people want limited liability, let them buy insurance. If people want to manufacture and offer services, and they worry about being sued, let them take extra caution not to cause devastations and denials. Is it so hard to conceive of businesses as businesses, and not as private dictatorships? Not as deniers of human-ness? Not as pillagers of the Earth? We can also eliminate the permitting system so that business people wouldn’t get permits legalizing poisons and destructions – which is the purpose of today's regulatory and administrative laws. We could make sure that businesses could not interfere in elections, lawmaking, debate over values and public policy – in the writing of tax laws and health laws and labor laws and laws conforming our society's existence with fundamental Earth laws. Richard goes into great detail about the stages he went through of learning the facts of how our world works. What's to be learned from the past half-century of organizing and resistance and electioneering and law-writing? Here's how I see it. Like activists and radicals of previous generations – we have been crushed. If we admit to this, if we internalize that crushing as reality – I believe people will find this incredibly liberating. That's the case with me. Because it enables me to abandon gobs of USA mythology, the holiday celebration stuff, the liberal versions of steady progress under a liberty-friendly, governance structure where, it is claimed, here the people rule. Generations and generations of bloody struggles to end human slavery, to get the vote, to be seen by the law, to be equal before the law, and on and on – are regarded as glorious victories provided by the exceptional liberty-loving American constitution writers and law-makers and law-interpreters and historians. We were born into a structure that provides no remedy to minority rule. We were lied to in grade school and high school. Our energies and resources and hopes have been channeled into making symptoms of minority rule a little less devastating while leaving every generation's minority rule structures and institutions and accumulations untouched. Once we grasp that nettle, we then can focus on revealing and changing. Since 1996 I have worked up copy of many of Richard's articles as well letters he sent me copies of provoking questions to the recipients. Included below are some points Richard emphasized in various forms, followed by a chronological listing of his writings on this site. An alphabetic listing is presented here. Three hundred years ago, the corporation was understood to be a convenience devised by monarchs. merchants, explorers and men of wealth. It was a legal device to gather up resources and hold property, to exploit and dominate people. After the American Revolution, it was generally understood that the people were—and desired to remain—sovereign over corporations. Accordingly, Americans limited corporate existence to a set number of years and spelled out rules each corporation had to follow. People who look beyond the corporate press can find tons of informed opposition to the corporate global production and trade agreements of the 1990s. Similarly, if we look, we can find many perceptive critics of the US constitution in 1787-88. Loosely labeled "Anti-Federalists," they contested the peddling of the constitution by Washington, Hamilton, Madison, Jay and other Federalists fresh from the Philadelphia convention at Independence Hall. . . . The fact is, more people than most of us ever heard about in school discussed, critiqued, debated -- and opposed -- the many undemocratic features of the US constitution. . . . Behind their "We the people . . ." generalities, what were the real intentions of the Federalists? The constitution, writes Herbert Storing, editor of a 7 volume edition of Anti-Federalist thought, "did not settle everything. It did not finish the task of making the American polity." This is not what most lawyers, judges, politicians, educators and editors say, but is what millions and millions of people mobilizing against corporate assaults need to believe. We will never "finish the task," but the job of every generation is to pick up the struggle. And a clear leg up over 1787 is that the classes of people which the constitution, the Supreme Court and the culture had defined as property or non-existent are now legal persons -- thanks to generations of their own vigorous political movements. When corporations wield the Constitution -- triggering the armed might of the nation against people seeking to function as self-governing -- they strip humans of our ability to govern ourselves. When public officials enable corporations, these public officials deny people's right to "self-governance." They are usurpers. . . . It is because people's human right to self-governance has been denied for so long by judges, legislators, executives and corporate managers wielding the Constitution against the people . . . by the armed forces, police, jails -- that the USA became a global and legally racist empire . . . that the USA's propertied and then corporate class were able to create a society deriving wealth and power from poisoning, destroying and exploiting people and the Earth at home and abroad. . . .
Time after time, men of property and corporations dedicated to building a global empire turned to the august justices of the Supreme Court. They, too, invoked the Constitution. The justices could have ruled to define these men of property and their corporations as subservient to the body politic. But the justices chose otherwise. The few times in over 200 years that federal judges sided with the rabble, wasn't it because people had been mobilizing vast movements for years and years and years . . . educating themselves and one another, confronting and challenging illegitimate power? Because people had been organizing despite being beaten and jailed and killed by police in service to the propertied? . . . . The Constitution was written by propertied men representing a minority of other propertied men fearful of the decentralized power and authority unleashed by the Revolution and written into the Articles of Confederation. So they wrote a plan of governance which made it easy for future generations of the propertied to keep future masses in line using "the rule of law" -- that is, by "legally" employing state violence and other means to shape people's values, thoughts and actions. Over time, they got proficient at camouflaging their rule behind corporate fairy tales and democratic myths. This work has of course been aided by their control over the training of lawyers. The purveyors of M-O-R-E want us to believe that human wants and needs are self-evidently fulfilled by these goals and strategies. People are not encouraged to inquire into the nature of processes of M-O-R-E, to figure out what has brought the good, to question popular theories of cause and effect, to penetrate the rhetoric and illusions of growth. For growth is IT. Growth has brought us our fantastic wealth. It will do the same again and again for us, and for anyone. It will eradicate undesirable isms, free the oppressed, restore the environment. It will stimulate the arts, save our cities, decrease human reproduction, save our farms. The purpose of this essay is not to rail against growth, not to offer an alternative to growth, not to suggest growth reform. Rather, I urge the expunging of the language of growth and the system of growth from the hearts and minds of those seeking democracy, fairer sharing of the world's wealth, and the integration of ecological principles into our lives and works. . . .
E.F. Schumacher, urging us to use our ingenuity with regard to our productive capacity, challenged the principal proposition of the metaphor of growth. Do you remember the opening lines of Small Is Beautiful (1975)? "One of the most fateful errors of our age is the belief that the `problem of production' has been solved." Schumacher did not suppress his incredulities. "I am not part of the growth debate. To talk against growth or to talk in favor of growth is emptiness." Instead, he chose to talk of people. Of community. Of appropriateness. Of ownership. Of empowerment. Of choosing. Of peace. He spoke the language of quality and accountability. The language of people. Today's corporate leaders received a head start from the men of property who wrote the Constitution. When the overwhelmingly white male voters of the thirteen states ratified the Constitution, the "rule of law" they adopted defined the majority of human beings in those states as property, or as invisible. Contrary to the democratic ideals unleashed by the American Revolution, the law in this newly-formed republic denied rights to women, African American slaves, indentured servants, Native peoples, and white males without property. All these human beings were written out of "We the people." Who represented their needs and aspirations? Not the men meeting behind closed doors in Philadelphia's Constitution Hall that hot summer of 1787. These men not only denied rights to the majority but also built barriers to democratic processes into their Constitution: indirect election of the president through the electoral college, indirect election of US senators by state legislators, a commerce clause, a contracts clause, an appointed Supreme Court as an eternal closed-door constitutional convention, to name a few. . . .
Why do corporations get away with it? Because with few exceptions, civic activists have not looked closely at this history. They have not contested the nation's corporate class over its grab of governing authority. So let's look more closely at how the nation got into this mess. Since the great corporate-imposed un-American scare following World War II, and the government repression of thought, speech, assembly and civic action it spawned, corporate leaders have been far more conscious about strengthening their governing role than have been most of their critics. In the 1970s, for example, they launched (and funded with millions of dollars) a nonprofit corporate attack group called "Americans Against Union Control of Government," a "subsidiary" of the National Right to Work Committee. As Gerald Colby described, "Like the Liberty Lobby of the 1930s, these groups served as a front for DuPont and other large corporations . . ." DuPont Dynasty, Secaucus NJ: Lyle Stewart Inc., (1984), p. 750. As far as we know, there has never been a people's group with a name like "Americans Against Corporate Control of Government." Only in the past few years have contemporary activists defending against corporate assaults begun to grapple with the reality that corporations govern the nation enabled and protected by the rule of law . . . by the Constitution. I cannot do justice here to the false assumptions, half-truths, distortions and manipulations upon which Moyers' speech is constructed. Adrienne Rich has written that we cannot understand ourselves unless we understand the assumptions in which we are all "drenched." Can it be any different for a nation? Moyers devotes only a few lines to the Constitution and the Founding Fathers -- saying nothing about what these Fathers designed the nation's plan of governance to be, to do. He does declare that "for all the rhetoric about `life, liberty and the pursuit of happiness,' it took a civil war to free the slaves and another hundred years to invest their freedom with meaning. Women only gained the right to vote in my mother's time. New ages don't arrive overnight, or without `blood, sweat and tears.' You know this." All true. But Moyers does not explain why it has been extraordinarily difficult for the majority to bring about changes in fundamental rights; why it has been difficult for the majority to govern. This is because people organizing for rights, seeking to define the nation's money, work and commerce, seeking to build institutions and mechanisms of governance, and trying to have a real say in deciding war and peace, always ran smack into the minority controlling the law of the land . . . into a minority directing the armed might of the nation. This is the governing system the Founders' Constitution put in place. . . .
Moyers' history tells us that the "norm" for sane and logical societal change -- for shifting the force of government and law from the oppressors to the oppressed -- is generations and generations of struggle. Don't worry about the structure of governance -- keep doing what you've been doing. No need to rethink history or law -- do more of the same . . . just try harder. And by lumping Populism with Progressivism, by extolling the Progressive Era's legacy of regulatory and administrative law, he joins countless 20th century leaders and historians in denying the Populist Movement. What they all work so hard to deny, alas, is the largest democratic mass movement in US history, a massing devoted to building upon the trampled ideals of the American Revolution and the Declaration of Independence. . . .
All to say: Populism was the last people's movement which told the truth about past and present -- told the truth about the present in order to unlock the past; unlocked the past in order to see the truth about the present. Populism was not about ending "corruption" or "excess." It was about ending private governance which had been the rule -- private governance first by a slave owning class, and then by a corporate class. It was about stopping public officials from using law and armed force to enable the few to deny the many. So the reason a "resurgent conservatism" in the late 1970s galloped so quickly and successfully was that the New Deal, and then the Fair Deal -- along with post WWII liberal theology and civic organizing -- did not contest the corporate class' authority to use the law of the land to govern. The two Deals did not set out to strip men of property and their corporations of the illegitimate privileges and constitutional powers they had seized from the Revolution on. They did not talk about such matters. Those who dared to raise such issues were disappeared during the great corporate+government redscare years. The New Deal and Fair Deal and New Frontier and the Great Society changed many people's lives for the better. But they left the history, language and constitutional doctrines of minority rule -- and the institutions of minority rule -- intact. They did not provide succeeding generations with tools to see or to confront the greatest concentration of wealth and power of all time. Year after year, corporate operatives drove their wealth and power into the Constitution, into state corporation laws, into building corporate and government institutions of propaganda, persuasion and coercion. Year after year, they enriched a corporate class under color of law. Year after year, liberals and progressives poured their energies into resisting assaults one at a time over and over again . . . splintering into single issue groups easily channeled into one-struggle-at-a time, few of which were about "rights," and most of which promoted false histories, polluted language and glorified seriously-compromised victories. A quarter century after a great anti-nuke-safe energy movement stopped 850 nuclear plants, why is the nation no closer to a solar transition? For how many decades have large numbers of dedicated, well-organized people been trying to "protect" family farms? To set in motion sane transitions in every industry, from health care to food, to media to transportation to forestry to mining to banking? Why have activist "victories" provided few tools to challenge the illegitimate power and authority which corporate managers wield against people, communities and the natural world? Why was it so easy for the Bush government to invade Iraq in the face of massive, well-organized and visible opposition in the US? Moyers' history says to activists: you've got the correct understanding of the past, embrace it, the USA is a democracy, you've been doing all the right things; keep marshaling information and organizing and trying to enforce the laws progressives and liberals have already passed. And just accept that for every single issue you are working on, the best you can do is make the problem a little less bad . . . and it will take you 50 years to accomplish some compromise you can then celebrate as victory. There is no alternative. He does not help people today understand that "Once defeated, [Populists] lost what cultural autonomy they had amassed and surrendered their progeny to the training camps of the conquering army." Many folks harbor dreams and visions of a nation characterized by democratic self-governance, no special privilege, and public officials dedicated to nurturing democratic institutions and democratic processes. But We the People can't get there from Moyers' tall tales. Today, growing numbers (not limited to old lefties and graying hippies) are realizing that Progressive-New Deal-liberal explanations do not help people understand what's going on today in this country. As cosmologist Thomas Berry has written: "The deepest crises experienced by any society are those moments of change when the story becomes inadequate for meeting the survival demands of the present situation."